All kinds of baby items in a lovely blue colour. All items are safe for babies and young infants. Most items are available within one week. 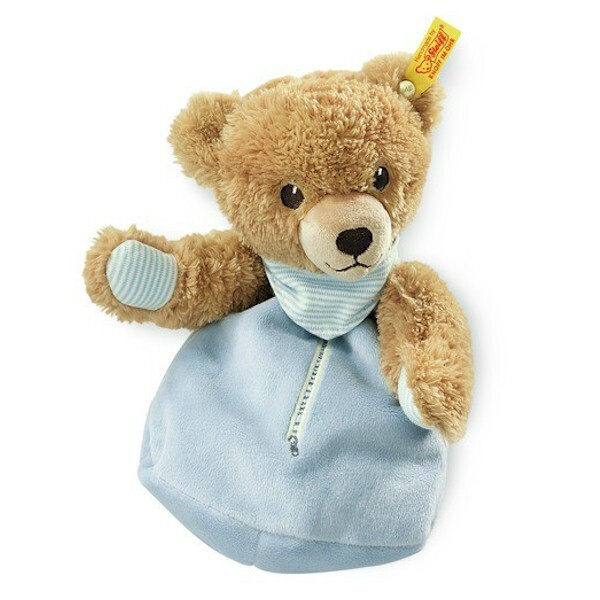 Steiff Sleep well bear blue 25cm. 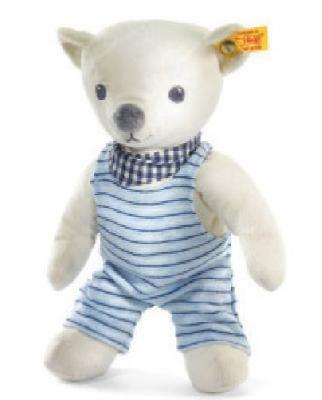 Steiff Baby EAN 239571 Sleep well bear blue, 25cm. This Steiff teddy bear is 25 cm. / 10" tall and made out of brown super soft plush and dressed in a blue/white outfit. He is filled with synthetic filling material and has embroidered eyes. This Steiff teddy bear is machine washable at 30° C and has the CE mark for safe toys. Steiff baby EAN 237508 Hoppel rabbit blue 20cm. 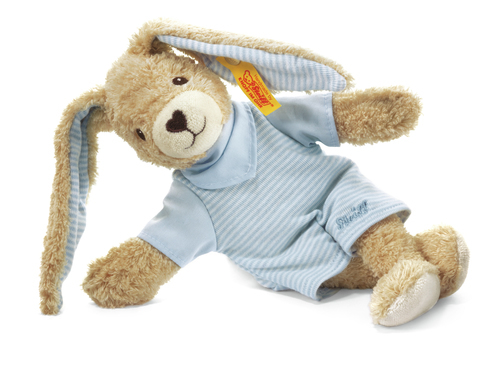 Steiff Hoppel Rabbit blue is made of fluffy, certified organically grown cotton. He is dressed with a blue/white overall, has embroidered eyes and a brown heart shaped plush nose. He is filled with synthetic stuffing material and machine washable at 30 degrees C. He has the CE mark for safe toys and is 100% safe for your child. 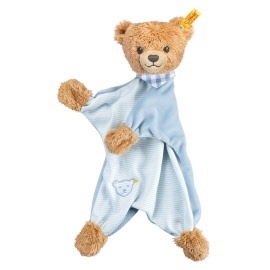 Steiff Baby EAN 239878 plush Sleep well bear blue heat cushion. Steiff Baby EAN 239878 plush Sleep well bear blue heat cushion, 25cm. Sleep well Boy with heat cushion. He is made of brown and blue cuddly soft plush and stuffed with synthetic filling material and pellets. In his belly he has a removable cherry pit pillow. He is with safety eyes and mashine washable at 30 degree C (cherry pit pillow not washable). He has the CE mark of safe toys for baby and small children. 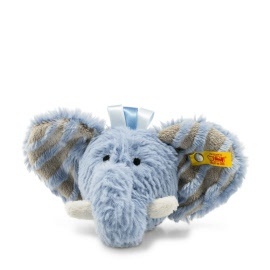 Steiff EAN 238543 Eli Elephant blue, 20cm. Eli Elephant is made out of blue super soft plush and dressed with a blue scarf. He is filled with synthetic filling material and has embroidered eyes. Steiff EAN 237478 Hoppel Rabbit comforter, 28cm. Hoppel Rabbit blue. Made of soft babyskin certified organically grown cotton. He has embroidered eyes and has the CE mark for safe toys. Maschine washable at 30 degree C.
Steiff EAN 237522 Hoppel rabbit grip toy blue, 12cm. 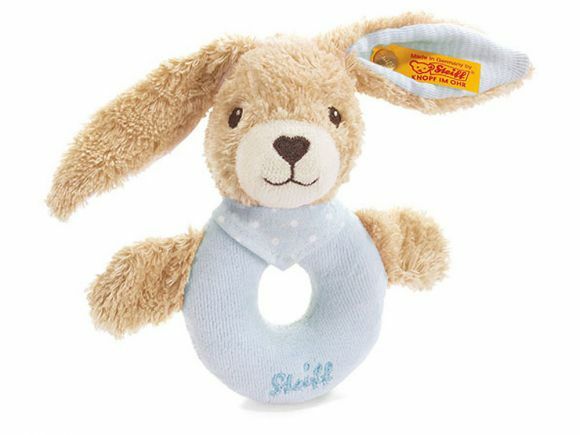 Hoppel rabbit grip-toy is made of fluffy, certified organically grown cotton. 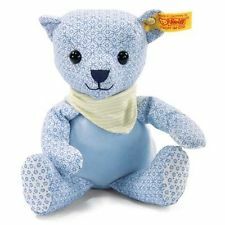 He has embroidered eyes and is machine washable at 30 degree C.
Steiff EAN 237058 rattle/ grip toy sleep well teddy blue. 12cm. Sleep well teddy rattler. He is made of soft blue and brown plush. He has embroidered eyes and is filled with synthetic stuffing material. 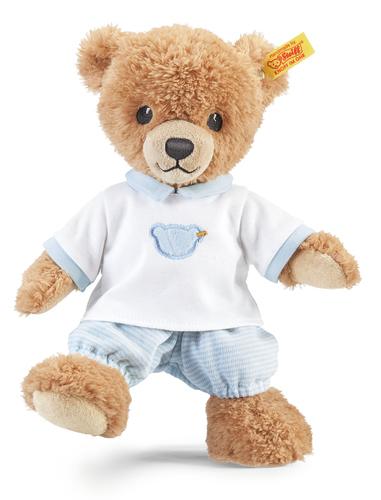 With CE mark for safe toys and machine washable at 30 degrees C.
Steiff EAN 237027 Sleep well teddy Music box blue, 20cm. Sleep well teddy with music box. He is made of soft brown plush. He has embroidered eyes and is filled with synthetic stuffing material. With CE mark for safe toys and machine washable at 30 degrees C. (Music box removable and not washable). 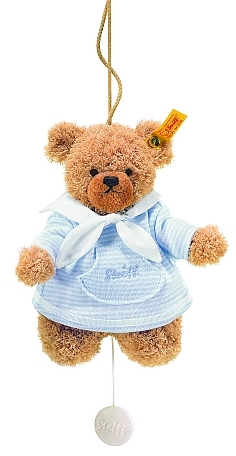 Knuffi is made of soft white plush and has a blue cotton outfit. He has embroidered eyes and is filled with synthetic stuffing material. With CE mark for safe toys and machine washable at 30 degrees C.
Steiff EAN 238116 teddy baby jongen, 20cm. Teddy baby boy is made of soft blue with white cotton. He has embroidered eyes and is filled with synthetic stuffing material. With CE mark for safe toys and machine washable at 30 degrees C.
Steiff EAN 239588 Sleep well bear comforter blue, 30cm. Steiff EAN 240522 Earz OlifaElephant Rattle Soft Cuddly Friends, 12cm. 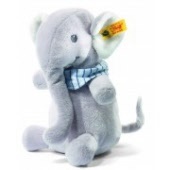 Earz Elephant rattle gives warmth and comfort with his big ears. He has ringlets attractive to babies and is soft and warm which provide comfort and softness. It's a wonderful present for a newly born and on many other occasions. It is made out of blue plush for baby-soft skin and stuffed with synthetic filling material. It has embroidered eyes and is machine washable at 30° C. It is with CE mark and stainless steel "Button in Ear"